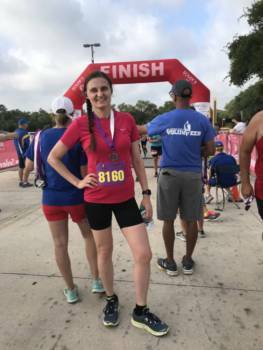 Northwest Vista College Director of Public Relations Renata Serafin participated in the San Antonio District 8 ’80s 5K run at the UTSA Main Campus on Saturday, June 23. Renata (47) finished fifth in her age group (40-49) with a time of 26:31.5 minutes. She was the 34th woman to finish the race and 108th person overall. There were a little under 2,000 people who participated in the race.